Screen printing is arguably most versatile in printing, almost everything can be used as substrate. Our company provide this 3 color 4 station screen printing package with all stuff needed by a small screen printing workshop. we show buyers skilled operation and application by words and video, achieving integration of technique ,equipment, material and service. Screen plate making is one of the most important procedures for doing screen printing business. This kit is specially designed for making screen printing plate. 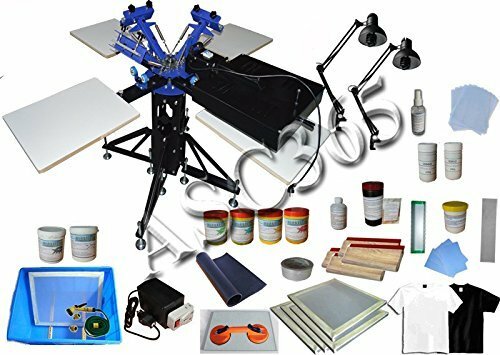 With this very low cost kit, you can easily make your own screen printing plate or doing screen plate processing business without buying other equipments or materials except for the computer and printer. It's easy operated, which will be your best choice! * Height of the flash dryer could be adjusted within 5.5" * The frame & flash dryer can rotate arbitrarily in 180 Degree Features Adjustable double-spring devices are available for screen frames of different weight. Screen clamp could be moved up and down, which is suitable for screen frame within 1.2" (3cm) thickness. All-metal construction, advanced electrostatic spraying and electroplating, durable, easy to clear and no rust.